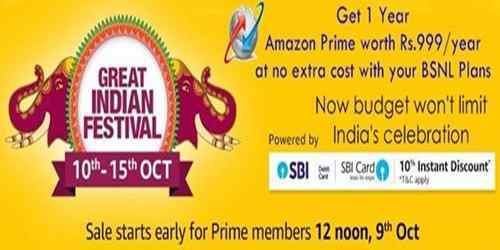 Giant Online store Amazon has announced the launch of its Upcoming Amazon Sale ‘The Great Indian Festival Sale 2018’ on account of Dussehra across India for Online buyers under various segments. However, BSNL being a Public Sector Unit (PSU) has partnered with Amazon India to offer Prime membership to its network users across the country. High speed 4G Technology provider and Business telecom Bharat Sanchar Nigam Limited to compete with private telecom players like Bharati Airtel, Vodafone and Reliance Jio has decided to introduce of ‘Amazon Prime package’ membership worth of Rs.999/- across all the DSL / FTTH Broadband plans with monthly rental of Rs.745/- above and Postpaid plans on or above Rs.399/- in all telecom circles. Airtel and Vodafone already associated with Amazon India now BSNL has also joined to compete with these private telecom operators to give maximum benefit to existing customers under Broadband and Mobile segment at without any additional cost. BSNL is offering ‘Amazon Prime Package’ membership to Broadband internet network and Postpaid mobile service customers at no additional cost for a period of ONE Year from date of activation, to all existing / new Broadband customers on PAN India basis for plans Rs.745/- (Broadband tariff plans) and above. What are the benefits will get through Amazon Prime membership? BSNL is providing One year of Amazon Prime membership at no extra cost to BSNL Postpaid customers i.e Mobile Postpaid and Landline Broadband customers. Offer is available for customers on Rs.399/- and above for Postpaid mobile or Rs.745/- and above for Landline Broadband plan customers. Further any Queries Customer to know more.